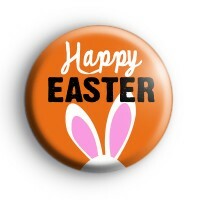 Bright orange 25mm badge with the text Happy Easter and the top of a white fluffy bunny . Our Easter badges are really popular each year and we have so many adorable Easter themed designs. Parents give them to their children, use them as favours at Easter parties and teachers like to hand them out at school. Not as tasty as a chocolate egg but this bunny badge is a fun addition to Easter. Make sure to browse our Easter badge category for more designs like chicks, eggs and lots more Easter bunnys too.